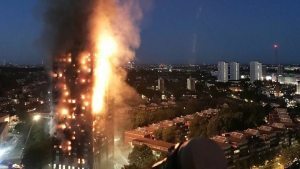 Insulation added to buildings like the ill-fated Grenfell Tower was a result of climate regulations, as this extract from a Sky News report shows. But the manufacturers themselves helped write those rules, and now some critics who tried to point out potential fire hazards in the materials say they were subjected to intimidation by them. The main lobby group for the plastic insulation trade was, until November 2017, called the British Rigid Urethane Foam Manufacturers’ Association [BRUFMA].